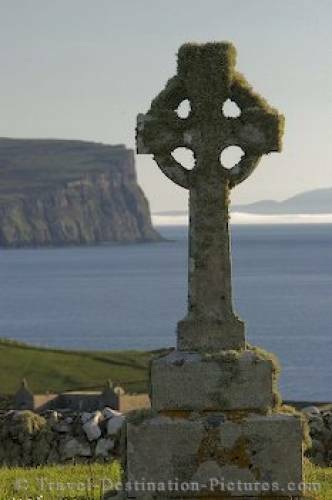 Evening at the tip of the Waternish Peninsula with a celtic cross in the foreground in Scotland, Europe. The perfect day on the Isle of Skye can be ended perfectly by watching the sunset at the quiet and remote location of Trumpan on the peninsula of Waternish. Here, beneath the ruins of an ancient church which was destroyed during the clan fights between the McDonalds and the McLeods, the golden light of the sunset gives the scenery some mystical atmosphere. Waternish Peninsula of Scotland, Europe.